It is in your dog and cat’s nature to run through the grass or hunt and chase prey. However, in Australia, home to the largest number of venomous snakes in the world, your dog and cat face a different, more dangerous type of prey hiding in the bush. 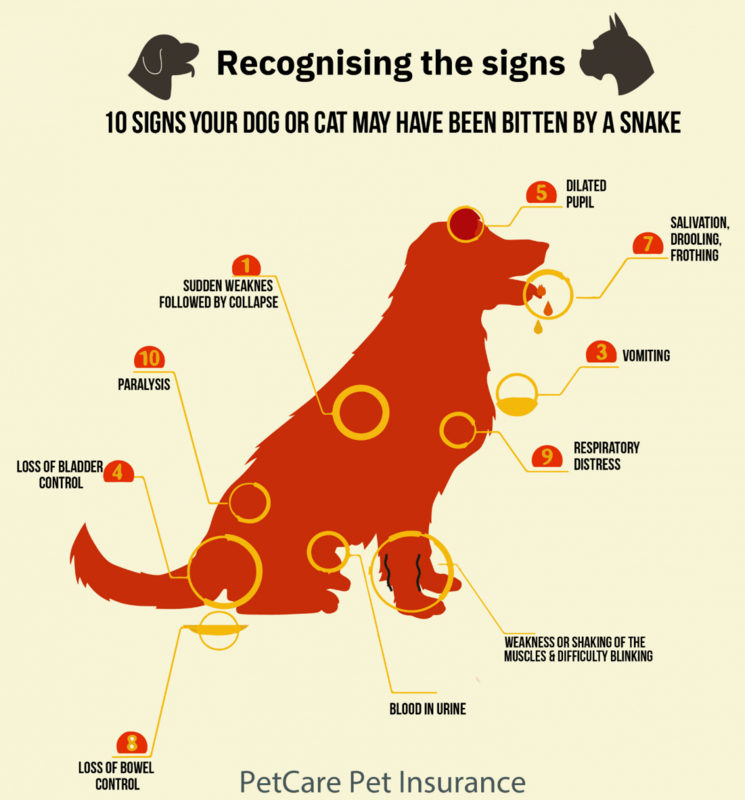 Almost 6,500 pets were bitten by poisonous snakes in Australia last year, and during the summer months when snakes are most active, this life-threatening emergency is more likely to happen. How can you prepare for and prevent snake bites on pets? If your pet is bitten, what steps should you take to save his life? Due to widespread housing development in major cities, snakes are found in both suburban and rural areas. You may believe your dog or cat is safe from snake bites if they steer clear of animal parks or bodies of water like lakes and beaches; but in fact, they are more likely to be bitten in and around their own suburban home. Between their natural hunting instincts and penchant for curiosity, your pets are likely to encounter snakes and react in a defensive or inquisitive way, especially in their desire to protect their home and territory. As warmer weather occurs, snakes begin to move in their search for food, shelter, or water, raising the chances of your dog or cat encountering one of them. Luckily, there are steps you can take to prevent these encounters from occurring. When a snake bites your pet, it injects venom from its fangs into the tissue underneath the skin. The poison is rapidly absorbed from the bite location and then carried into the lymphatic system into the body’s circulation. Snake venom has multiple toxins that can cause a range of damage to vital functions and tissues. These toxins attack the nervous system, interfere with the body’s clotting mechanisms, cause pain and organ damage, interfere with breathing, and cause paralysis. Because snakes are on the move in summer, you can try to cut down the odds of your pet and a snake crossing paths with each other. Snake bites and pets are a problematic combination. Some common sense and simple precautions can make all the difference in the world. Here are some preventative steps to limit your pet’s exposure to snakes no matter the season. Taking these steps to keep up your property helps to limit the number of snakes that may attempt to find refuge there. Eliminating places that snakes hunt and rest may help to keep your dogs and cats safe. Train your dog to recall: if your dog confronts a snake, you need him to listen and obey you and return to you when you call him. Keep dogs under close supervision: do not allow your dog to dig under rocks or logs, run through tall grass, or explore holes as these are places snakes like to rest. Walk your dog on a leash and keep him by your side at all times outside of your home. Keep your cat indoors: if your cat is one who enjoys staying inside most of the time, consider making her an indoor cat year round thus preventing her interactions with snakes outside. Create or purchase a “catio”: some cats are outdoor cats, even part of the time, and you can give them the best of both worlds by using a fenced-in or screened-in area that may extend from a porch, window, or doorway. What if, despite your best efforts, your dog or cat is bitten by a snake? How do you know when snake bites on pets occur, and what symptoms should you be looking for? What are the Common Signs of Snake Bites in Cats? Cats are most frequently bitten by the copperhead, death adder, Eastern brown snake, tiger snake, black snake, and red-bellied black snake. Because cats tend to wander when they are outside, you are unlikely to witness a snake bite, and may not know where, when, and what type of snake injured your cat. It can also be difficult to determine whether your car was bitten at all as some bites are not visible and cats typically mask their injuries until they are life-threatening. It may take up to 24-hours for symptoms of poisoning for symptoms to manifest, and as the venom spreads closer to the cat’s heart, that period is critical for your cat’s survival. Note that not all of these symptoms may appear and they are likely to increase and decrease in severity. Even if your cat seems to recover from the bite, a trip to your veterinarian is a must. What are the Common Signs of Snake Bites in Dogs? Understand that is is possible for your dog to exhibit some or all of these symptoms if snakebitten, or even other symptoms entirely. If you suspect or know that a snake has bitten your dog, take him to the veterinarian immediately. The sooner your dog receives treatment, the better his odds are of surviving the bite. 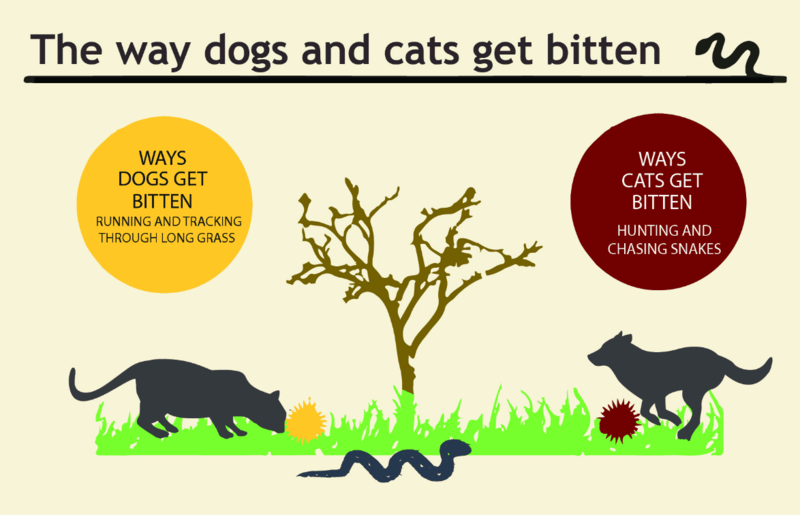 What should you do if your dog or cat has been bitten on by a snake? According to the Australian Veterinary Journal,although cats are more likely than dogs to be snakebitten, they have a 91% chance of survival with antivenom treatment than dogs, whose survival rate is 75%. Therefore, if you suspect that your pet has been bitten, getting him to a veterinarian as quickly as possible is key to increasing the odds of saving his life. Keep calm and keep your emotions under control. Keep your pet as still as possible. Leave the snake bite wound alone; do not wash the wound or apply ice, alcohol, or a tourniquet to the wound. Do not try to catch or kill the snake yourself; all Australian snakes are protected, and you may end up bitten yourself. If possible, try to remember as much about what the snake looked like and report those specifics to the veterinarian. Should circumstances allow, consider contacting a snake catcher to come and remove the snake from your property. Once your pet arrives at the veterinarian’s office, a series of events will occur. 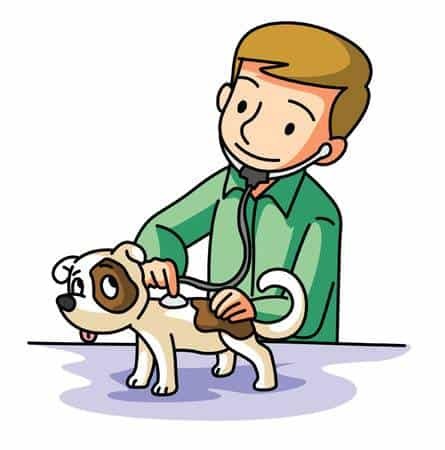 First, the veterinarian will assess your pet and administer a broad antivenom to neutralise the spread of poison through the body. Supportive care, such as intravenous fluids or feeding tubes or oxygen, is likely the next step in the care of your pet. Paralyzation may require manual bladder expression until the pet can urinate on his own. Tests such as a complete blood count, faecal exam, blood smear, clotting times, and cultures to check for bacterial infections may be necessary as well. 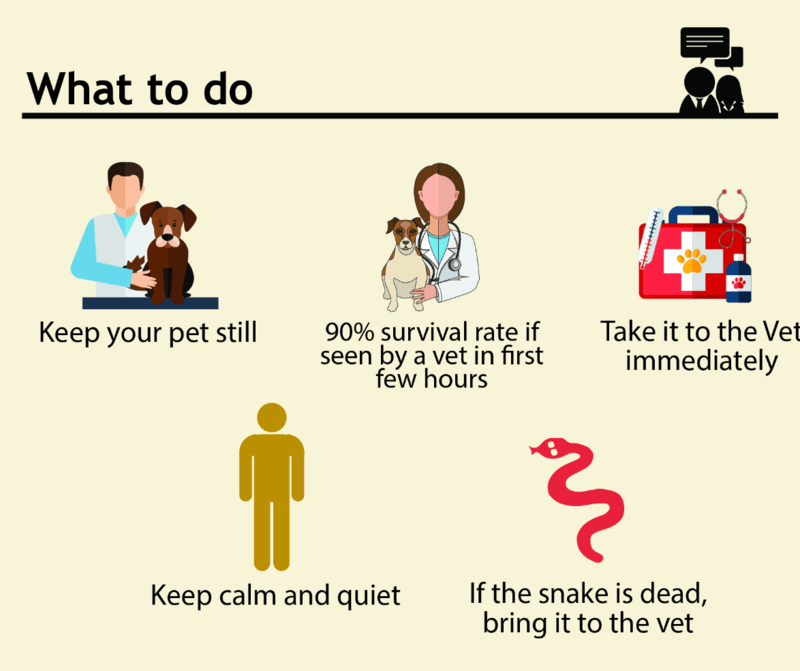 Recovery from a snake bite takes between 24 and 48 hours if your pet sees a veterinarian promptly after the snake bite; however, if the toxin is especially damaging, your pet may need an extended stay at the hospital. Each pet reacts differently to treatment, and your pet may need to be on antibiotics for a few weeks after the bite. It is imperative that you keep your dog or cat as quiet s possible during the recovery period. By taking some common sense steps, you can limit the chance a snake will bite your cat or dog. Careful attention to your property, immediate surrounding areas, and proper pet training can prevent your pet from being on the receiving end of a nasty, potentially life-threatening snake bite. Do you have any tips for other pet parents as you are? Please comment below and help others to keep their pets safe.